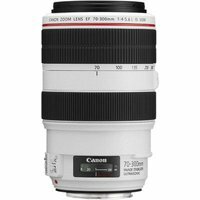 The Canon EF 70-300mm f/4-5.6L IS USM is a versatile telephoto lens that features a 4-stop Image Stabilizer for greater flexibility when shooting handheld. 2 x UD elements and a floating lens group deliver excellent sharpness and imaging performance, and its 8-blade aperture produces beautiful bokeh. This durable and rugged lens construction will meet the needs of any demanding photographer.